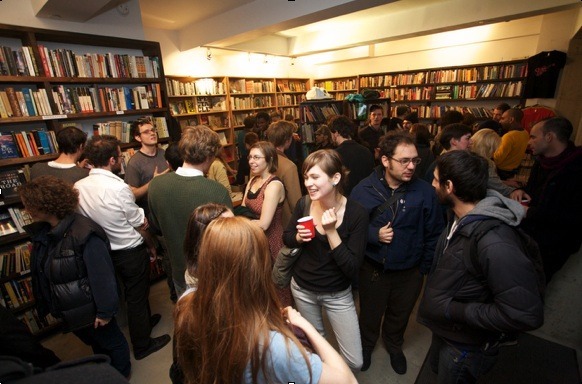 bookthugnation is an used bookstore and community space in Williamsburg, Brooklyn. The store was started by four independent booksellers who have sold books on the streets of NYC for years. We carry a wide selection of quality used books at low prices. Our focus is in Literary Fiction (boasting one of the best used fiction sections in NYC! ), Film and Philosophy. We also have solid collections of Sci-Fi, Mystery/Noir, Poetry, Drama, History, Erotica, Foriegn Language, Graphic Novels, Childrens and Art. Martial Arts, too!. Along with good books we hold regular events and gatherings, including, but not limited to, author readings, movie screenings, lectures, neighborhood meetings, kids nights, etc. If you have an event idea for our space please email us at info@bookthugnation.com, or stop by the store and run it by us. Why are we doing this? BTN believes that independent bookstores are an essential part of a healthy, creative New York City. We strive to be an active community space that fosters the literary arts in Brooklyn while being a welcoming place where anyone can walk in, have a cup of coffee and talk about books. The store/community space is a collaborative work-in-progress. Please join us! BTN is dedicated to our friend, and original Book Thug, Tim Mumford.